The mystique of an ancient text filled with historic discourses and debates has called to Jews throughout the ages. My father never stopped studying Talmud. His study spanned many spaces and many seasons. At our first home in Brooklyn, where he was a synagogue rabbi, he would set up a beach chair overlooking an empty lot, lay the Talmud on his lap and study, often surrounded by his four young children. In our second home, he set up his beach chair in a small enclosure in the driveway. Clad in shirtsleeves in summer, in winter he would don a black overcoat of textured wool with a velvet collar. When it snowed, he covered himself with a blanket. Much later, after I left home, my parents built a small porch overlooking a garden, where roses bloomed from early spring to late autumn. The modest porch became my father’s small kingdom, hisdalet amos (four cubits) of sacred space, where in retirement he continued to immerse himself in pages of Talmud and commentary. For centuries Jews have set aside time and space, either by themselves, in the traditional two-person havruta (study group) or in yeshiva, to study the intricate back and forth arguments of Rava, Papa, Resh Lakish and Rabbi Johanan, among other greats whose voices make up the halakhic discourse recorded in the Talmud. Daf yomi, a page-a-day cycle of Talmud study, was adopted in theshtetl synagogues of Hungary and secretly in private homes in the Warsaw Ghetto. And Jews huddled together in the concentration camps to study smuggled pages of the Talmud. Once the study of intricate talmudic dialectic was limited to men. But in recent decades the sacred study spaces have expanded, crossing boundaries of geography, age, gender and religious conviction. Talmud is learned in the classrooms of American day schools, in modern seminaries where women study for the rabbinate, in havrutaamong groups of businessmen, congressmen, C.E.O.’s and judges who meet during lunch hour, in synagogue and Jewish community center study groups, online, on tape and on morning commuter trains. Even those unfamiliar with Hebrew can fulfill the biblical injunction, “And you shall study it day and night,” thanks to English translations from Soncino Press and Mesorah Publications. The 73rd and final volume of The ArtScroll Library Schottenstein Edition Talmud Bavlifrom Mesorah (a 15-year endeavor) was published last February; a complete set was presented to the Library of Congress in Washington, in a special ceremony chaired by House and Senate leaders. The centuries-old arguments are also the basis for modern halakhic decisions, as Iris Lav, 59, of Washington, D.C., discovered in her weekly two-hour study group. The course, led by Rabbi Ethan Seidel of the Conservative Tifereth Israel Congregation in Washington, and under the auspices of the Foundation for Jewish Studies, included a talmudic debate in Tosafot, a 12th-century commentary, on tractate Rosh Hashana 33a. The debate, says Lav, centered on whether women could recite a blessing over the performance of a mitzva that is time-bound and from which they are exempt. Rabbi Jacob ben Meir (referred to as Rabbenu Tam), grandson of ubiquitous 11th-century commentator Rashi, ruled that it was permissible for women to recite the blessing, an opinion accepted by Ashkenazic Jewry. Maimonides disagreed, and his ruling is followed by Sefardim. Centuries later the debate over women’s performance of time-boundmitzvot was cited in the 1980’s by Rabbi Joel Roth, professor of Talmud and Rabbinics at the Jewish Theological Seminary, who wrote a responsum asserting that women could be ordained and included in a minyan. There were, over the centuries, women of distinction, such as Beruryah, whose thoughts were included in talmudic texts. In the 11th century, Rashi (Rabbi Solomon ben Isaac), who had no sons, maintained that his daughters not only study Talmud but, according to some rabbinic historians, they wrote the commentary on certain tractates. The mother of the first Lubavitch rebbe, Shneour Zalman of Lyady, was well-versed in Talmud. In the 18th century, Rabbi Joshua Falk, one of the great commentators on the Shulhan Arukh, Code of Jewish Law, wrote about his mother’s erudition. However, these voices were few and far between until the mid-to-late 20th century, when women’s demands for inclusion started to be heard. In New York, the Orthodox Yeshivah of Flatbush and Ramaz School have been teaching Talmud to girls since they opened their doors in the 1930’s. In the 1970’s, the great talmudic scholar Rabbi Joseph Soloveitchik gave a discourse in the beit midrash of Yeshiva University’s Stern College for Women in New York, which lent even greater legitimacy to Talmud study for women. 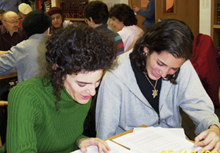 The Orthodox Drisha Institute, also in New York, is where several hundred women of all denominations have committed to serious study of Jewish texts since it opened in 1979. It was the first institution in the United States that taught Talmud to women on an advanced level. “Formal Talmud study for women is still very young, but it has moved very quickly,” notes Dvora Zlochower, director of full-time programs at Drisha. There is an additional psychological dimension to Talmud study for those who have experienced it since their youth. “[It] was a rite of passage in fifth grade at the Orthodox Chofetz Chaim Yeshiva in Brooklyn I attended,” says Rabbi Moshe Bleich, an educator in Silver Spring. “In high school, we took other subjects, but Talmud was the common bond. Talmud study today starts early for many day-school students. Jennifer Feldstein, 15, began with private tutors at age 11 in preparation for delivering a shiur (discourse) at her bat mitzva. “At the beginning I was confused and a little scared about whether I could [do it],” she recalls. Today as a student at Ramaz, she finds Talmud an intellectual challenge as well as a guide for personal living. Daf yomi is another contemporary addition to Talmud study. Introduced in Poland in 1923, it was the brainchild of Rabbi Meir Shapiro, who believed daily study of a prescribed page of the Talmud would create an obligation for learning and unite far-flung diaspora communities. According to the late Rabbi Moses Sherer, who served as executive director of Agudath Israel of America, the central agency fostering the program, daf yomi revolutionized Jewish study in the United States. It transformed the daily pattern of life as well as the deeds of thousands and inspired the establishment of institutions of learning across the country. To accommodate working people, daf yomi classes begin as early as 5:30 in the morning or as late as 10 in the evening; the entire Talmud takes seven and a half years to complete. Last March, tens of thousands of Jews from throughout the country gathered at Madison Square Garden in New York to celebrate the culmination of the cycle of study. Forty-year-old Avi Feder of Clifton, New Jersey, who received ordination from the Rabbi Isaac Elchanan Theological Seminary at Yeshiva University 15 years ago, attends a morning daf yomi class several times a week. He also studies with a havruta on Monday evenings, travels to New York Tuesday evening to learn with his rebbe and spends one week of the summer studying at a Catskills resort with the same rebbe. Feder, father of two children, 6 and 5, is a resource-room teacher at the local day school and owns two used-clothing stores. He also exemplifies the value of learning Torah lishma, learning for the sake of learning. A 5th-century compilation of what is known as the Oral Law, the Talmud is a body of teachings that reflects scholarly tradition on Jewish law, ethics and history peppered with anecdotes and humor—from discussions on the proper way to slaughter an animal to the story of gladiator Resh Lakish and how he came to be the study partner of Rabbi Johanan. The books commonly referred to as the Talmud are really the Talmud Bavli, composed of 63 tractates that detail decisions and dialectic from sages who lived in the Babylonian diaspora. In addition, there is the Talmud Yerushalmi, which contains the debates of sages in Israel. The Talmud has a set layout and pagination. The center text, written in Hebrew and Aramaic, includes the Mishna, the halakhic tradition gathered by Rabbi Judah Ha-Nasi in the 3rd century, and theGemara, discussion and debate on the Mishna by the amoraim, sages who lived between 200 B.C.E. and the 5th century c.e.. Commentaries from Rashi and Tosafot surround the center text (for further explanations of the layout, see www.acs.ucalgary.ca/~elsegal/TalmudPage.html). They in turn are surrounded by later commentators—part of a cross-generational debate that continues today.